Protection, preservation, and enhancement of the economic, social, cultural, and esthetic values that establish the desirable quality and unique character of the city. Improvement of the city as a place for living, by aiding in making it more healthful, safe, pleasant, and satisfying, with housing representing good standards for all residents and by providing adequate open spaces and appropriate community facilities. Improvement of the city as a place for commerce and industry by making it more efficient, orderly, and satisfactory for the production, exchange and distribution of goods and services, with adequate space for each type of economic activity and improved facilities for the loading and movement of goods. Coordination of the varied pattern of land use with public and semi-public service facilities required for efficient functioning of the city, and for the convenience and well-being of its residents, workers, and visitors. Coordination of the varied pattern of land use with circulation routes and facilities required for the efficient movement of people and goods within the city, and to and from the city. Coordination of the growth and development of the city with the growth and development of adjoining cities and counties and of the San Francisco Bay Region. That the City achieve the greatest possible preparedness to protect against injury and the loss of life in an earthquake. The Housing element of the General Plan makes sure the local governments plan to meet the existing and projected housing needs of the entire community by providing the policy background for housing programs and decisions. The Housing element does not modify land use, specify areas for increased height or density, suggest specific controls for individual neighborhoods, implement changes to the Zoning Map or Planning Code, or direct funding for housing development. Because of the growing industries in San Francisco in areas such as financial and professional services, biotechnology, digital media, and clean technology, the population of the city is correspondingly increasing, creating an urgent need for additional housing for the low and very low-income households. It is estimated that the city must plan for the installment of approximately 31,000 additional housing units, 60% of which should be tailored for households of extremely low to moderate income. Prioritize permanently affordable housing. With the high housing cost, a wider variety of housing must be made available to meet the financial and spatial needs of the City’s diverse population. This should be accomplished by the addition of new units as well as preserving and maintaining the existing housing compounds. Recognize and preserve neighborhood character. San Francisco residents treasure their neighborhoods’ unique physical and cultural character, thus components of the Housing Element cannot be applied universally and instead necessitates strengthening the best qualities of individual neighborhoods by listening to the input of the community itself. Integrate planning of housing, jobs, transportation and infrastructure. It must be recognized that neighborhoods require not only housing but also public infrastructure to support everyday life, such as transportation, open space and community facilities as well as private retail and neighborhood services. Neighborhoods should also be family-friendly with facilities tailored for children. Cultivate the City as a sustainable model of development. The City aims to prioritize housing development in areas with improved transit availability and accessibility to decrease the amount of green gas emissions and promotes “green” housing development. Houses built on the slopes of San Francisco - G. K., Mike. San Francisco hill. Photograph. Economic Vitality – to promote a healthy and diverse economy that produces jobs that provides personal well-being and ability to spend daily life in the city. Social Equity – to assure that the various segments of the city’s labor force benefit from economic growth by reducing the number of unemployed, especially those due to race, language or lack of formal occupational training. The Element works to achieve these interrelated goals by focusing on enhancing the city environment, maintaining a stable and diverse economic base and fiscal structure, and providing expanded employment opportunities for city residents, especially the unemployed. The Element is used to form short range plans, special area plans and to guide public actions by government agencies that are relevant to San Francisco’s major economic sectors such as manufacturing and industry, maritime activities, office/administrative services, neighborhood commercial retailing, specialized retail trade, government services, and visitor trade. The Citywide System - San Francisco is filled with open spaces created in the last century, such as Golden Gate Park and parks on hilltops and lining the shoreline alongside military forts. The current challenge is to maintain these existing open spaces with limited funding alongside rising costs and shortage in staff and equipments. Because the quality of the recreation facilities and open spaces is crucial in determining the desirability of the city, this is an important part of the plan. The Shoreline - With large areas of undeveloped shorelines on the western and northern border of the city, the shoreline holds the largest potential of providing new parks and open spaces. It is expected that future development will improve access to the shoreline as well as providing additional parks. The Neighborhoods - Changing demographics of neighborhood populations increased the number of the elderly and children living in dense areas with little open space facilities. Thus, the current goal is to better distribute parks and recreation facilities to improve accessibility for those in need of these spaces. Downtown - Open spaces in dense downtown are important to provide places for people to interact and to create visual relief in a compacted environment. The current goal is to overcome the high cost of land and compete with the continued need for office buildings to create open spaces and public parks. Regional Open Space - San Francisco is also able to benefit from the regional open space system, composed of public and privately owned public spaces. A large portion of the city’s open spaces are managed by agencies that manage areas in the Bay Area, and there are large amounts of publicly owned open space in the form of vineyards, orchards and ranch land. Because there is no single agency to manage conflicts between growth, development, and open space preservation, the City needs to work with the different agencies throughout the region. Open spaces such as Golden Gate Park and the shoreline give people a place to relax - Lingl, Herb. Aerial view of Ocean Beach, Golden Gate Park and the Golden Gate bridge with downtown San Francisco. Photograph. San Francisco is a city that consists of a variety of geographic elements such as the bay and ocean, and contains three large city centers and smaller communities along the bay and inland valleys. This variety makes improving the transportation system more difficult. As San Francisco and the cities around it develops, the importance of transporting goods and people throughout the area in such a way that balances out the needs of the community and the surrounding neighborhoods while taking into account the environmental effects, increases noticeably. The underlying assumption of the Transportation Element is that traffic levels cannot rise any further in order to maintain a desirable living space in respect to environmental reasons and every day needs. Although the city has made numbers of changes and addition to the city’s transportation system such as freeways and parking facilities, traffic congestion remains a problem in a densely packed small city with 19th century roads not designed for so many automobiles. Furthermore, single-occupant automobile produces the most air pollution and is the least efficient in terms of land use and natural resources compared to any other transportation method. Therefore, the goal of the city now is to improve public transportation and access to other alternatives that appeal to the users in terms of cost, ability, convenience and personal preference while keeping congestion as low as possible. San Francisco is known for a variety of appealing transportation alternatives and people enjoy the attractiveness and agreeable, walkable character of commercial and residential districts. The city uses the least amount of land and resources for accommodating automobiles among other communities in California, creating a design that is compact and easily accessible, adding to the market strength in downtown and business districts. The city and Bay Area’s air quality has been maintained above all federal standards of pollutants, and is the only large metropolitan area in California to be designated as an Attainment Region by the Environmental Protection Agency. The city’s transportation policies, thus, continues to serves as a model to other metropolitan areas across the country. The Urban Design Element works to both develop and preserve the physical character and order of the city, while balancing the relationship between people and their environment through pressures and needs for change. Its goals are to recognize, enhance and conserve the positive attributes of the city and improve the living environment based on human needs. The plan has four sections – City Pattern, Conservation, Major New Development, and Neighborhood Development – and they respond to issues in each respective area. San Francisco’s streets vertically climb hills - Places to See: San Francisco Hills. San Francisco is a city that has a unique pattern composed of a natural base with man’s development built upon it. People enjoy and live with this compatible pattern made of geographical aspects such as water, hills and ridges, open spaces and landscaped areas, streets and roadways, and buildings and structures. The pattern not only help people recognize specific districts and neighborhoods while assisting them understand the city in terms of logic and cohesion, it also gives people important psychological effects, providing a sense of place and purpose and reducing stress in a busy urban life. The two controllable elements that help strengthen the city pattern and thus given important attention in the policies of this Element are visually prominent landscaping and street lighting, and an exact system for them is still under development. There are several components in the city that has developed over time and should be conserved to keep the unique feel of continuity and relief that the peninsula gives its people. Natural areas such as sand dunes, hills, cliffs and beaches are irreplaceable resources that provide people a place to rest and escape from the chaos of an urban setting. The Bay and open spaces are also areas that are seen and used by residents. Older buildings have its own history and create a unique contrast with the new buildings, and streets regulate organization of buildings and also provide lighting and create the views of the city. The characteristic pattern of San Francisco has remained similar while change is continuous and continues to occur. The city has strict building height restrictions, and construction of these are done with extreme care, for a tall building may enhance the topographic form of the city and provide people with a sense of direction by giving people a destination, while it may also block views and sunlight. Bulky buildings have risk of seeming out of place in regard to its surroundings while blocking views and pathways. In building new compounds, it is crucial to consider the existing shape of the city and to fit in and naturally become a part of it. One of the most important aspects to an individual’s life is the neighborhood they live in and is a part of. People want to live in a comfortable and safe environment, and it is obvious that the neighborhood environment will be better if residents participate in the planning process. This section works to improve maintenance of a neighborhood such as its open space and recreation facilities and the overall design of the area, to balance the needs of its diverse residents and environmental aspects. The Environmental Protection Element focuses on finding a better balance between the people and their environment through protecting non-man-made aspects of the city, such as plants and animals. The element tries to protect and preserve wildlife by restoring qualities of natural resources and preventing further pollution. It also works to conserve energy and aims to reduce the use of hazardous materials in the city as a whole. This element also combines state-mandated elements that concern natural resources conservation and transportation noise with an energy management plan. There are nine sections to the Community Facilities Element that each focuses on the various facilities’ needs and objectives. Effectiveness of police service is enhanced when provided on a neighborhood level. Adaptability and flexibility of police facilities are essential for the changing community. Although facilities enhance police operations, the prime responsibility for public safety rests with police personnel and the community. Available services and facilities catered for the diverse needs of life enhance the quality of community life. Expanding community responsiveness to meeting social needs and enriching human life requires the development of adequate and flexible facilities to house needed services. While neighborhood centers provide facilities for hosing services, the success of center operations rests with the community. Additionally, this element contains sections concerning Fire Facilities, Library Facilities, Pubic Health Centers, Educational Facilities, Institutional Facilities, Wastewater Facilities and Solid Waste Facilities, and each aims to improve the efficiency and effectiveness of the respective facilities. Creating a greater public awareness of the hazards and risks that face the city will result in an informed commitment by public agencies, private organizations and individuals to prepare for future disasters. The responsibilities to develop and implement programs to promote safety and economic resilience, mitigate risk, increase preparedness in response to emergencies are all distributed to different agencies. Cooperation among these different entities is crucial for the programs to be effective. New policies and programs must be developed to minimize risks from natural hazards and expedite the recovery process. Reduce the risks of loss of life, extended economic interruption and other serious impacts as a result of earthquake by existing hazardous structures. Using these assumptions, the element works to achieve its goals by establishing policies and carrying out a number of plans and programs. They also work to prepare for a quick recovery after such a disaster. The Air Quality element is designed to regulate air quality control in response to the growing population and numbers of automobiles coming from inside and outside the city. It is composed of six sections that each focuses on different aspects of improving air quality. The sections are (1) adherence to air quality standards, (2) improvements related to mobile sources, (3) land use planning, (4) public awareness, (5) reduction of dust, and (6) energy conservation. Improving air quality through automobile reduction and land use planning that pushes the use of public transportation will cause beneficial results in health and economic growth while also conserving energy and preserving buildings affected by air pollutants. In addition to the nine elements the General Plan has plans concerning specific areas of the city that has its own unique characteristics. The area plans consists of policies and objectives that are made specifically for the corresponding areas, and are structured to enhance and maintain each area’s special qualities while adjusting them accordingly to the needs called for by the changing times. One of the most unique of these area plans concerns San Francisco Chinatown. San Francisco is known for its oldest and large population of Chinese nationality – the second largest in the country. 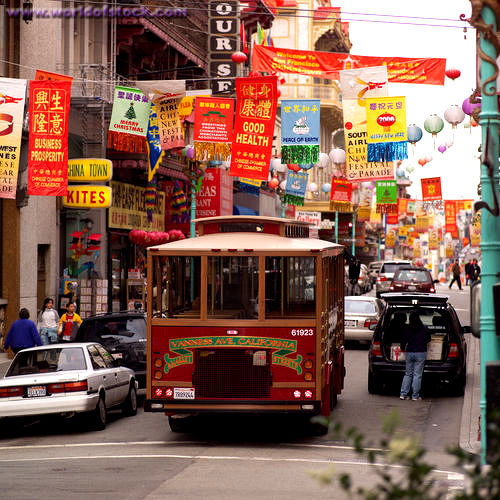 The San Francisco Chinatown contains the highest concentration of one ethnicity and longest continuity of history with the area containing the original streets and avenues of the city, such as Grant Avenue, the oldest street of San Francisco. Although Chinatown was once destroyed by the 1906 earthquake, it was rebuilt in the same location (south slope of Nob Hill in the north-eastern part of the city) and remains there today, housing an estimated population of 100,754 according to the 2000 Census. The area has a Chinese design using bright red, greens and yellow and Chinese-style buildings and pagoda style towers in the center. They were meant to distinguish the area from the rest of the city and attract shoppers and tourists with its clearly Chinese essence. The plan concerns an area of 30 blocks and works to preserve and conserve its historical and cultural elements, increase supply of housing while supporting the role of Chinatown as a residential area, promote tourism and commerce, and improve transportation to fit the landscape and structure of the area.